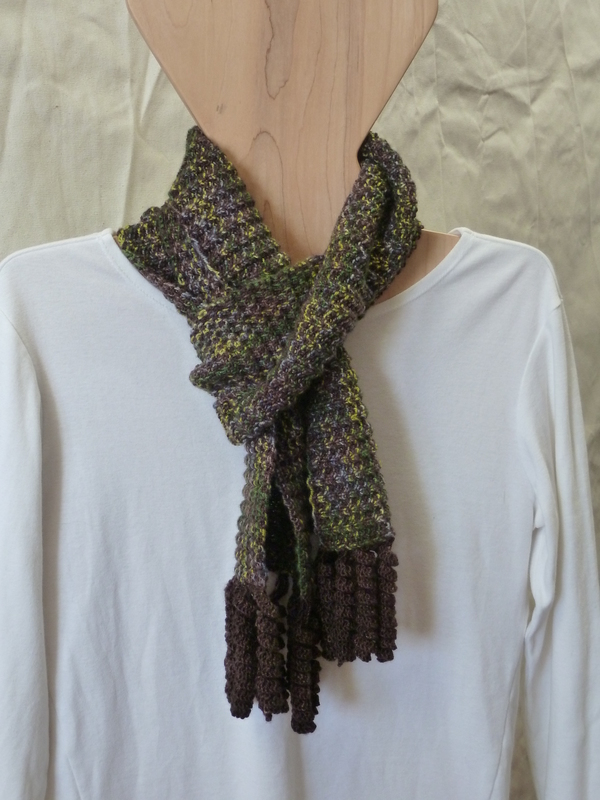 I wove them with a variety of yarns: alpaca, baby llama, organic wool and rayon chenille. They all came out nice and soft and drapy after washing; the alpaca and baby llama shrank the least in width, not too surprisingly. 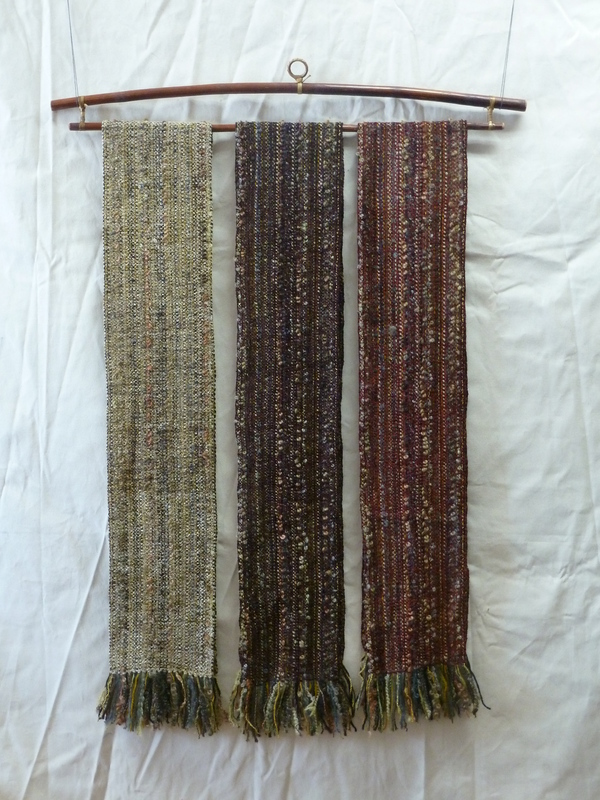 They all shrank about the same in length off the loom and washed: 70″ as woven under tension, about 64-65″ after finishing (exclusive of fringe). There was another one in the dark slate blue wool which I may keep for myself. 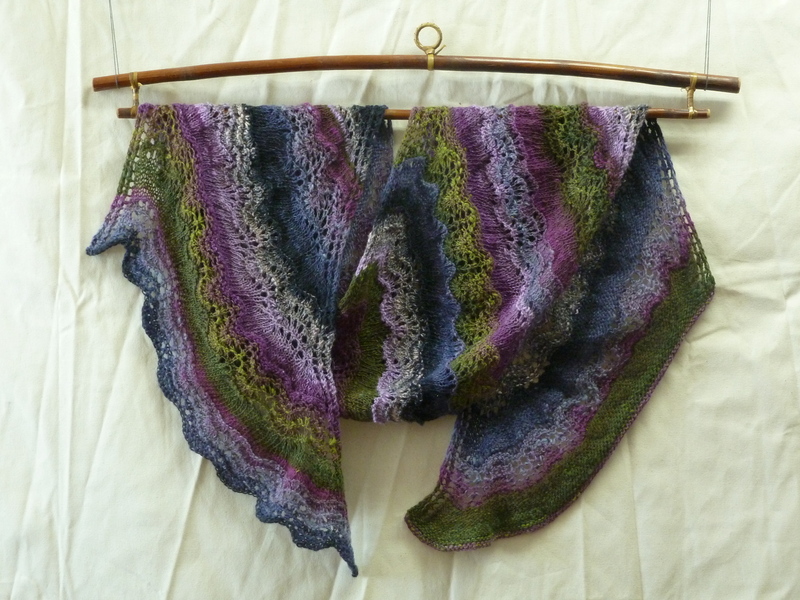 I’ve been doing some studio re-organizing and ran across a pattern I had purchased online, and some Noro Kureyon Sock yarn I had set aside for the project. I am not sure why I had that sock yarn, as I am SO NOT a sock knitter! 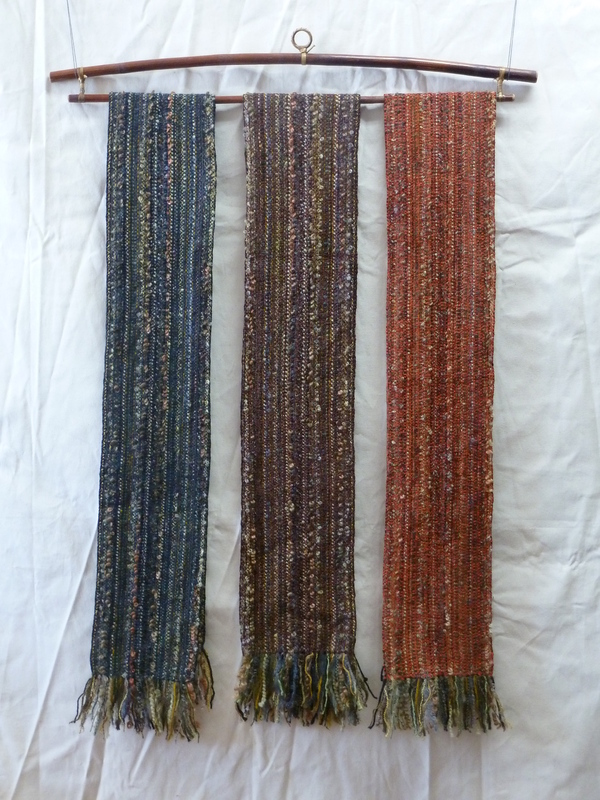 Maybe it was intended for a woven and fulled (slightly felted) project. Who knows. 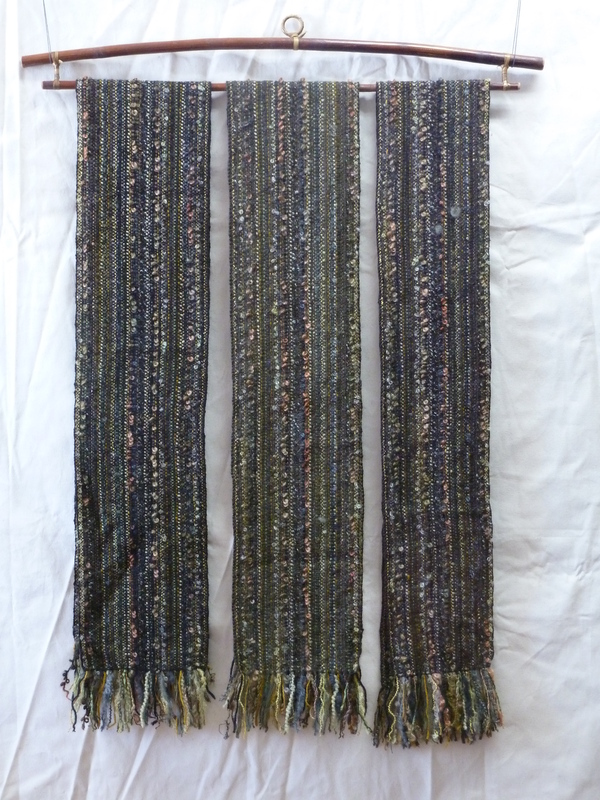 Anyway it has now become this: Noro Knots by Kieran Foley. I started it with the size 8 needle he used, but felt it was a little too loosely knit, so started over with a size 7 (4.5 mm). I wound up doing 6 repeats of the charts instead of the 5 repeats he did, and I think it came out about the same length. I used all of 1 skein and about 1/3 of the second one, so I could have made it one set of chart reps longer. Kureyon is a somewhat rough yarn (in my opinion) and the sock version is 70% wool and 30% nylon. Still, when washed, it did soften up nicely. I didn’t block it with wires or pins, just spread it out on the guest bed once soaked, rinsed and spun out to remove excess water. Very fun to do and I did change around the colors as he suggested, to avoid getting regular repeats of the color sequence. I think it is more interesting that way. 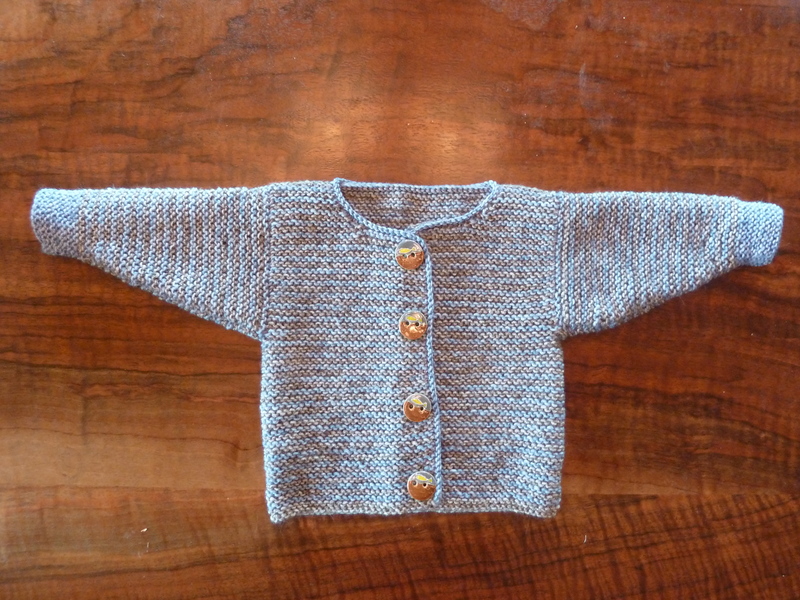 I am also not much of a baby-item knitter, but a couple of weeks ago I knit this up for someone special who is having her first child (a boy). 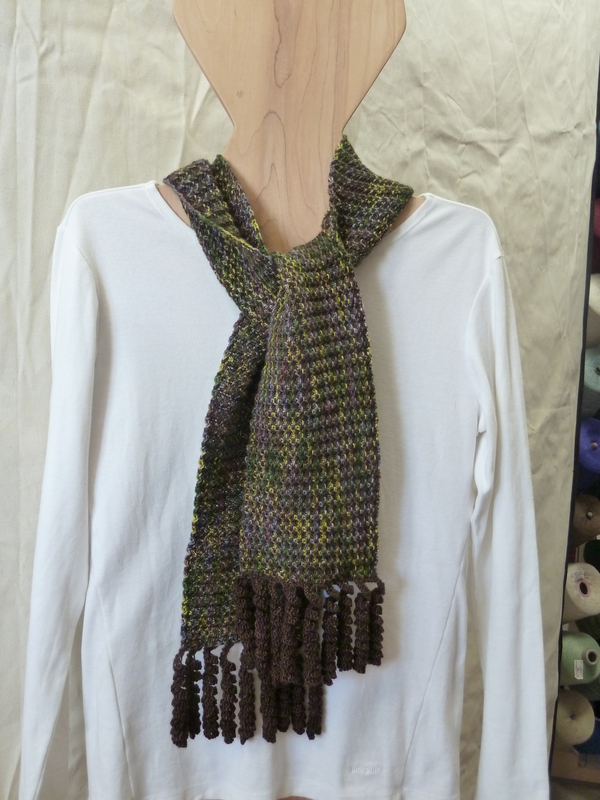 I used some leftover Queensland Merino Spray in 2 colors; the pattern is from a Debbie Bliss baby knits book. on March 8, 2014 at 11:37 am | Reply t.e.d.d.y. 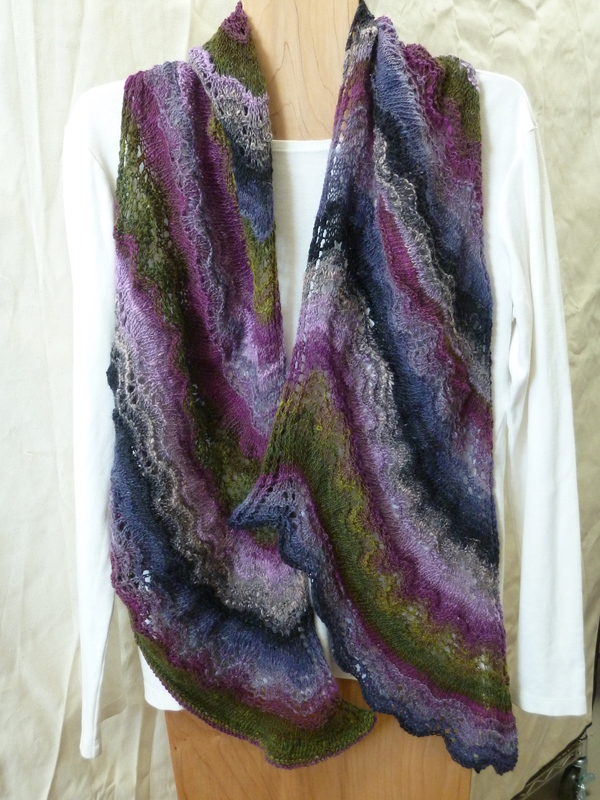 Love the colors in your Noro Knots scarf – Great use of “sock yarn”! 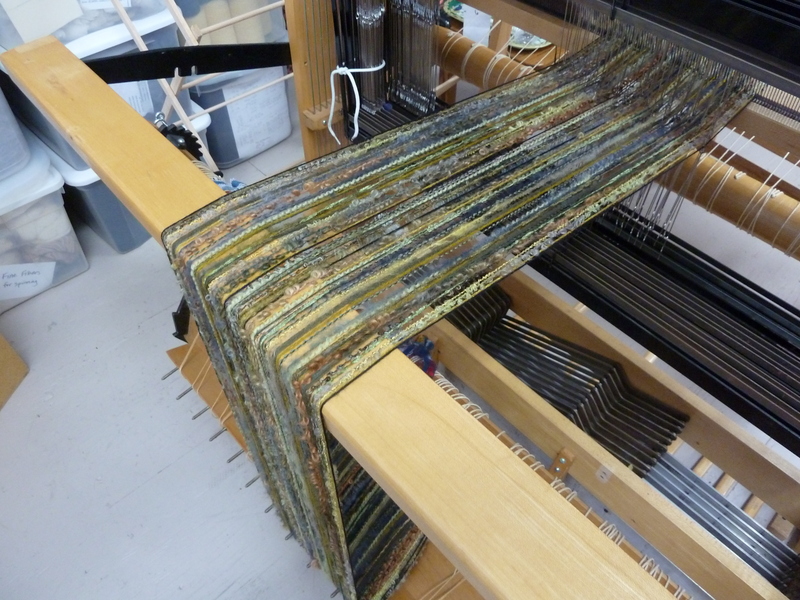 Beautiful work, am inspired to put on another multiple project warp.